The ‘Standard Model’ of particle physics successfully describes the smallest constituents of matter. But the model has its limitations – it does not explain the dark matter of the universe. Christoffer Petersson, a research scientist at Chalmers University of Technology, has found a solution. His theories are now being tested at the particle physics laboratory CERN. Physicists describe the smallest constituents of nature – elementary particles and forces acting between them using a set of theories known as “the Standard Model”. This model was developed in the 1970s and has been very successful, particularly in predicting the existence of undiscovered particles. In recent decades, particle physicists have discovered one of the predicted particles in the Standard Model after another in their particle accelerators. The last in the series was the Higgs particle, the existence of which was confirmed by the scientists at the particle accelerator Large Hadron Collider (LHC) at CERN in 2012. This completed the Standard Model. The problem is that there are several things the Standard Model is unable to explain, for example the dark matter that makes up a large part of the universe. Many particle physicists are therefore working on the development of new, more comprehensive models. One of them is Christoffer Petersson, who carries out research in theoretical particle physics at Chalmers University of Technology in Sweden and the Université Libre in Belgium. Together with two research colleagues he has proposed a particle model based on what is known as supersymmetry. This model contains more elementary particles than the Standard Model, including dark matter particles. In addition, the model gives the Higgs particle different properties than the Standard Model predicts. The model proposes that the Higgs particle can distintegrate into a photon (a particle of light) and particles of dark matter. However, these properties are quite difficult to discover – you have to look for them specifically to have a chance of finding them. But Christoffer Petersson is fortunate – his model has met with a response at CERN. Two independent experimental stations – Atlas and CMS – at the Large Hadron Collider are now looking for the very properties of the Higgs particle his model predicts. If the properties are there, it is a clear indication that the model fits. “It’s a dream for a theorist in particle physics. LHC is the only place where the model can be tested. It’s even nicer that two independent experiments are going to do it,” says Christoffer Petersson. In the first studies the volume of data was unfortunately too small for it to be possible to either confirm or reject Petersson’s model. A Higgs particle has been created in an LHC detector and has then disintegrated into four muons. According to Christoffer Petersson’s model the Higgs particle can also disintegrate into a photon and particles of dark matter. “But we are already in full swing with new analyses in which we are testing his model in other ways and with more data. We congratulate Christoffer Petersson for having done an important job,” says Zeynap Demiragli at the CMS experiment at CERN. 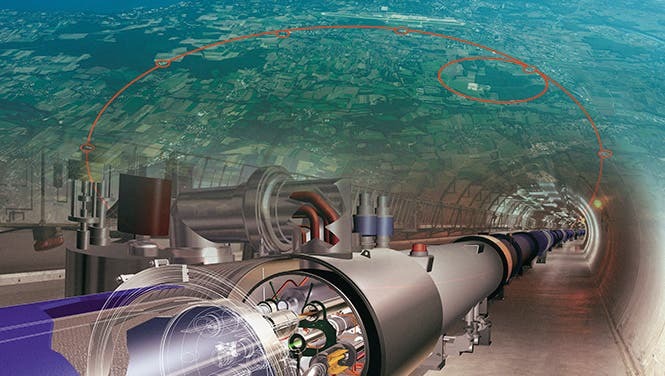 After being closed down for a time for an upgrade, LHC will start up again in the spring of 2015. With higher energies in the accelerator, the experiments will finally gather sufficient data to evaluate Petersson’s model properly. He is on tenterhooks awaiting the results. “If the model is found to fit, it would completely change our understanding of the fundamental building blocks of nature. If not, just the fact that they are willing to test my model at CERN is great,” he says. "The Big Bang was a Mirage from a Collapsing Higher-Dimensional Star"